India’s Ministry of Defense (MoD) has issued a request for proposal for nine medium-range maritime reconnaissance (MRMR) aircraft for the Indian Navy, plus 38 anti-ship missiles. The Navy has taken delivery of the first of eight Boeing P-8I Poseidon jets, and Boeing Harpoon anti-ship missiles. Although the new RFP seems to encourage smaller, lower-cost airframes and weapons, its terms may limit the bids. The RFP states the aircraft must fly a transit of 400 nm at 300 knots and patrol 400 nm for four hours at a height of 10,000 feet, configured with two missiles with a range of about 50 nm. The MoD has called for a pre-bid meeting with the vendors in early October to clarify queries. “It is confusing. Does the Indian navy want turboprops or jets?” asked one potential vendor. The RFP was sent to eight potential vendors: Airbus Military (for the C-295 MPA); Alenia (for the ATR 72 MPA); Antonov (for an MPA based on the An-70); Boeing; Elta (for an MPA based on the Bombardier Q400); Lockheed Martin (for the SC-130 version of the Hercules); Saab (for the 340 or 2000 MSAs); and Embraer (for an EMB-145-based MPA). It is believed that as an alternative to more P-8Is, Boeing could propose its maritime surveillance aircraft (MSA) with the recently identified Bombardier Challenger 605 as the platform. This has the same sensor suite as already carried by the P-8A Poseidon, but could offer lower operating costs. “As [they do] elsewhere in the world, price matters and capability matters…we are in discussions with a number of Asia-Pacific countries, and there are several customers interested in [the MSA’s] capabilities,” Chris Chadwick, president of Boeing Military Aircraft, said at the Paris Air Show in June. 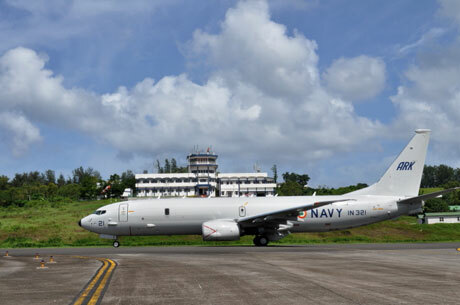 Some in the industry have questioned the logic of the Indian Navy’s choosing the same platform for the MRMR as it did for the long-range requirement for which the P-8I was chosen. “Jets are not efficient doing patrol at low levels and dropping life rafts. Ideally, the navy needs three sizes of aircraft,” said an official related to manufacturing.